My name is Joona Kangas. I’m a 21-year-old freeskier from Levi, Finland. I started skiing when I was two-years-old and freeskiing has been my passion since I was nine. I love skiing because it’s cool, challenging and I can express myself through it. I lived my first years in Central Finland where I started skiing at Himos Ski Resort. At the age of five I moved with my family to Finnish Lapland where I have had a great chance to continue skiing. 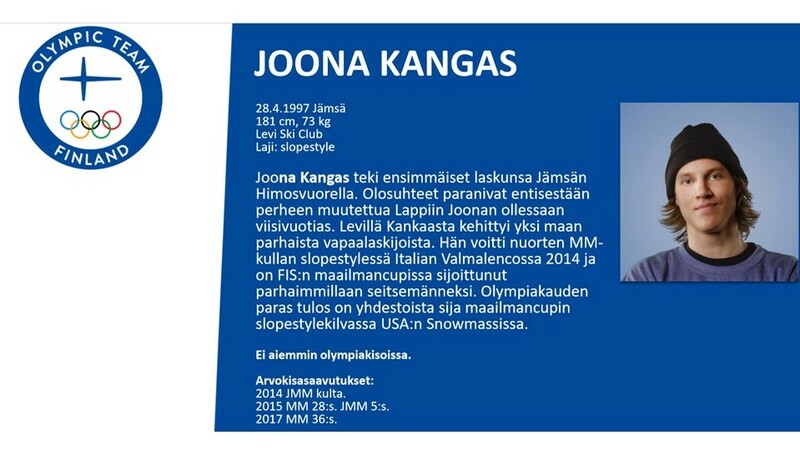 Since 2012 I have represented Finnish National Team in Ski Slopestyle. In April 2014, I won the Youth World Championships in Valmalenco, Italy. That was the best competition result of my skiing career so far. Since 2017, I have competed in men’s ski slopestyle world cup the best result being 7th. I was honoured to represent Finland at the Winter Olympics in 2018. The men’s slopestyle event in freestyle skiing at the Olympics took place on 18 February at Bokwang Phoenix Park, Pyeongchang, South Korea.